Location: From the intersection of Hwy 45 and Hwy 70 on the east side of Eagle River, continue east on Hwy 70 approximately 9 miles to a parking area on the south side of Hwy 70 just past Military Road. Terrain varies from mostly level to hilly. This mountain biking trail is groomed for cross-country skiing in winter. Trail difficulty is marked (beginner, intermediate, expert). The trail showcases the many opportunities provided within the National Forest. 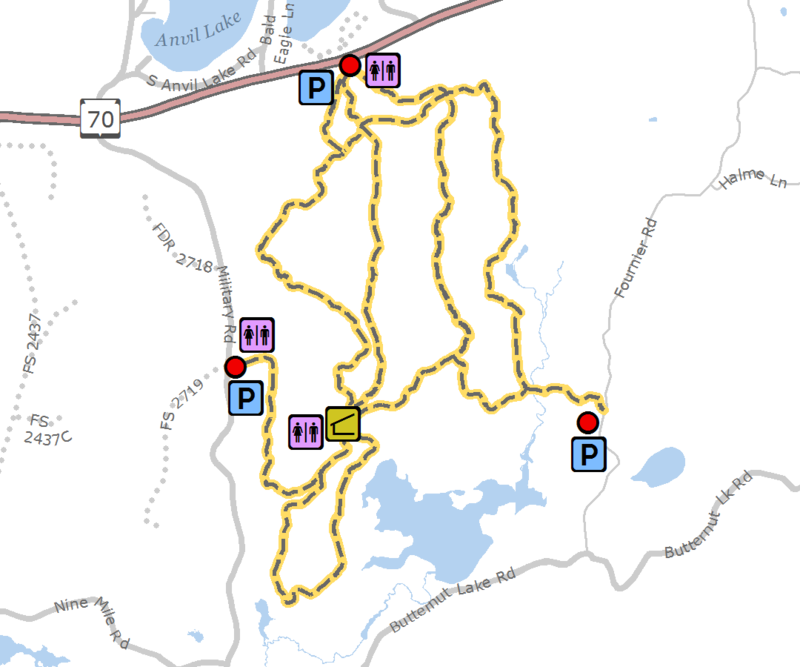 Parking area (sticker required) is located just east of the Anvil Lake Campground entrance and south of Hwy 70. Part of the National Recreation Trail System. Designated watchable wildlife area. Pets allowed on leash.